Download "Successful CRM The External Implications By Russ Richmond PART II"
1 Successful CRM The External Implications By Russ Richmond PART II (Link to Part I In the first installment of this series we examined the marketing culture in many organizations today and the challenges they present for any CRM initiative. We also explored the concept of CRM and the implications from customer, company and competitive viewpoints. 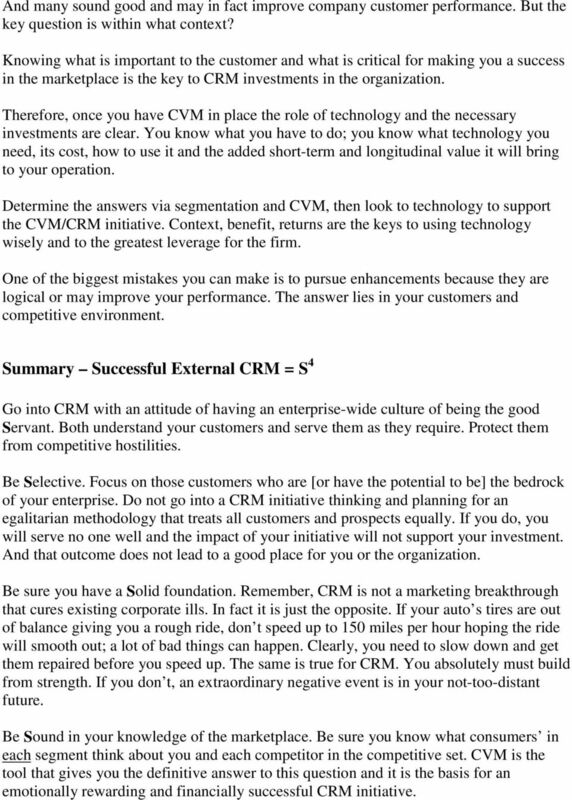 We ended with a series of questions to help you determine your intestinal fortitude for pursuing a CRM initiative. In this segment we will explore the external ramifications of such a strategy. While your external CRM strategy will have to be within the framework of your business model, there are certain critical similarities that you must master for a successful initiative. What are these truths that apply universally? 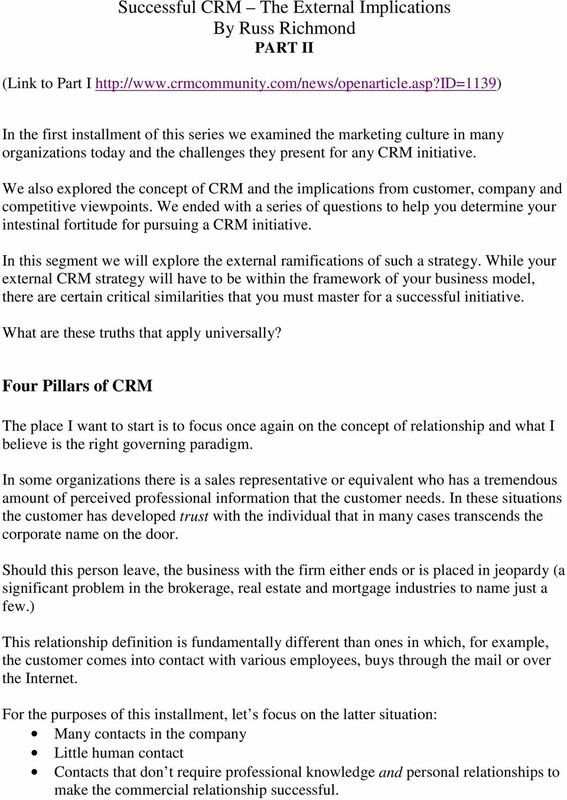 Four Pillars of CRM The place I want to start is to focus once again on the concept of relationship and what I believe is the right governing paradigm. In some organizations there is a sales representative or equivalent who has a tremendous amount of perceived professional information that the customer needs. In these situations the customer has developed trust with the individual that in many cases transcends the corporate name on the door. Should this person leave, the business with the firm either ends or is placed in jeopardy (a significant problem in the brokerage, real estate and mortgage industries to name just a few.) This relationship definition is fundamentally different than ones in which, for example, the customer comes into contact with various employees, buys through the mail or over the Internet. For the purposes of this installment, let s focus on the latter situation: Many contacts in the company Little human contact Contacts that don t require professional knowledge and personal relationships to make the commercial relationship successful. 5 Within each competitive set, the company with the best value wins. As you can see, the slope of the line is critical to your CRM strategy. 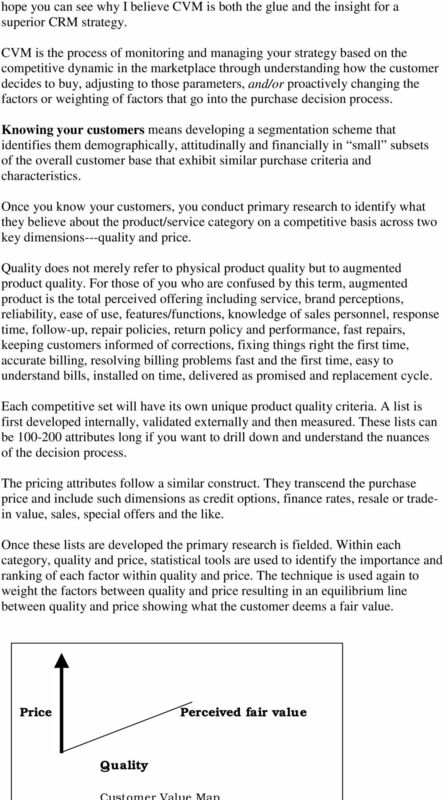 If you happen to be in a category that has destroyed the importance of quality and brand [creating a steeply sloped perceived fair value market], it is a commodity, a price game, and unless you change the way your targeted customers weigh the factors, nothing but the lowest price will win. Knowing this helps you construct a winning CRM strategy. 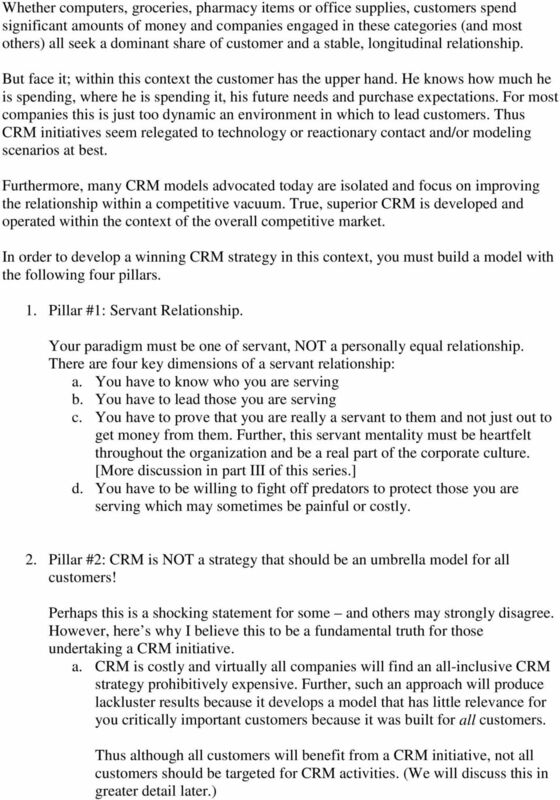 CRM within this developmental framework is a winner. Within any other framework, it could be a grand waste of time. Think about your own company. I m sure you do customer satisfaction surveys and the scores are rather high. Yet, ever notice that these scores have little predictive value in terms of customer retention and prospect conversion. 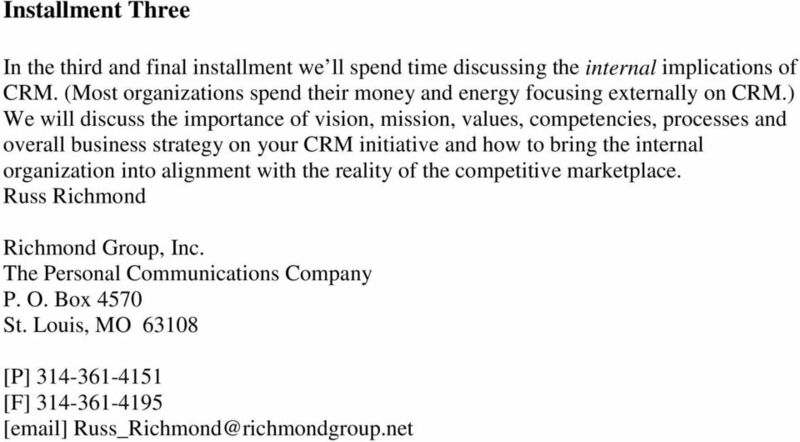 That s because they are done in a silo, your customer base, and not within the competitive context. That is exactly what CVM does and it is the foundational piece for a welldesigned, enterprise-wide CRM initiative that produces superior results. When CVM is in place you will know where to make the investments that will produce the greatest results. Finding someone who can help you through this maze is not easy. But actual results show that companies who make the effort achieve superior competitive customer satisfaction, superior growth, increasing market share and competitively superior profitability. All within about 6 months! And that s what it is all about! The Role of Technology Few would argue that CRM software and technology is front and center in application selling today. There are many different applications and implementation costs and considerations. 6 And many sound good and may in fact improve company customer performance. But the key question is within what context? Knowing what is important to the customer and what is critical for making you a success in the marketplace is the key to CRM investments in the organization. Therefore, once you have CVM in place the role of technology and the necessary investments are clear. You know what you have to do; you know what technology you need, its cost, how to use it and the added short-term and longitudinal value it will bring to your operation. Determine the answers via segmentation and CVM, then look to technology to support the CVM/CRM initiative. Context, benefit, returns are the keys to using technology wisely and to the greatest leverage for the firm. One of the biggest mistakes you can make is to pursue enhancements because they are logical or may improve your performance. The answer lies in your customers and competitive environment. Summary Successful External CRM = S 4 Go into CRM with an attitude of having an enterprise-wide culture of being the good Servant. Both understand your customers and serve them as they require. Protect them from competitive hostilities. Be Selective. Focus on those customers who are [or have the potential to be] the bedrock of your enterprise. Do not go into a CRM initiative thinking and planning for an egalitarian methodology that treats all customers and prospects equally. If you do, you will serve no one well and the impact of your initiative will not support your investment. And that outcome does not lead to a good place for you or the organization. Be sure you have a Solid foundation. 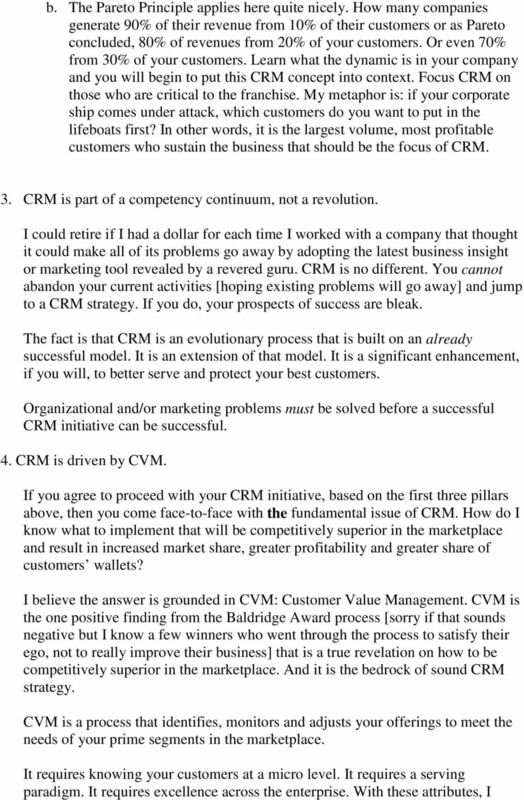 Remember, CRM is not a marketing breakthrough that cures existing corporate ills. In fact it is just the opposite. If your auto s tires are out of balance giving you a rough ride, don t speed up to 150 miles per hour hoping the ride will smooth out; a lot of bad things can happen. Clearly, you need to slow down and get them repaired before you speed up. The same is true for CRM. You absolutely must build from strength. If you don t, an extraordinary negative event is in your not-too-distant future. Be Sound in your knowledge of the marketplace. Be sure you know what consumers in each segment think about you and each competitor in the competitive set. CVM is the tool that gives you the definitive answer to this question and it is the basis for an emotionally rewarding and financially successful CRM initiative. AnswerNow Guides Why Live Service Matters! What You Need To Know. To Grow GETTING GOOD OOD LEADSL SPECIAL REPORT. by Gerry Foster. Gerry Foster Marketing. All rights protected and reserved. What You Need To Know... To Grow 1 GETTING GOOD OOD LEADSL by Gerry Foster Gerry Foster Marketing What You Need To Know Getting Good Leads The Bible says, Where there is no vision, the people shall perish. Energy, Momentum, Motion Changing Community Perception Strategies for Reversing Outmigration Copyright 2012 by, Inc No part of this presentation can be reproduced or distributed without written consent. Exercise 7.1 What are advertising objectives? 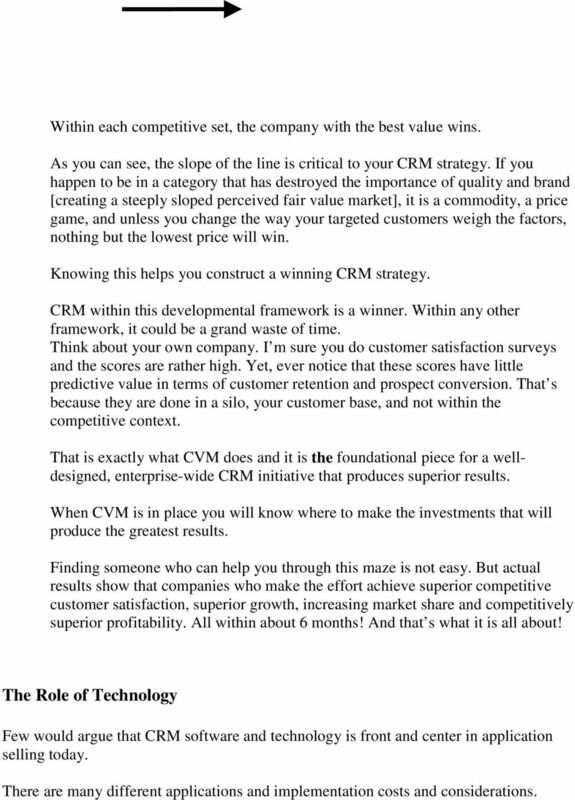 Improving Marketing Results with CRM Introduction Marketing is not perceived as an exacting science. Many times, marketing plans, campaigns and other activities are planned from guesswork or past "experiences". Mail tracking in today s marketplace - Why it is more than just a cost for suppliers By AccuZIP Inc.
WHITE PAPER. Bring back the Officer of First Impressions! The decision to grow is yours. Jiffy Lube Uses OdinText Software to Increase Revenue. Text Analytics, The One Methodology You Need to Grow!